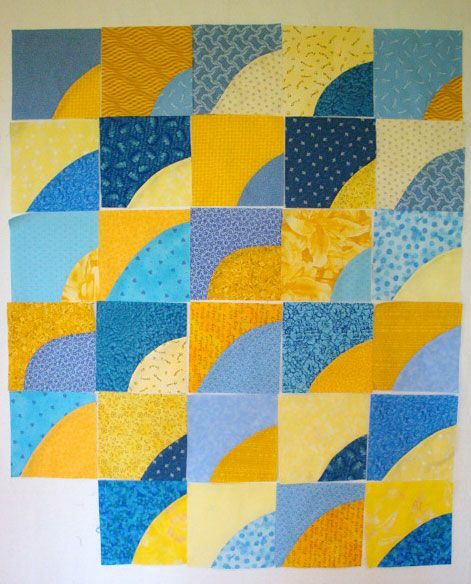 Have you hesitated to make a Drunkard's Path quilt? Do the precise curved seams look too difficult to tackle? If your answer to those questions is "yes," you're not alone, and there's a solution for you – a wonky Drunkard's Path quilt made with blocks that are very easy to sew. Just follow the step by step instructions and photos and you'll be a Drunkard's Path pro at it in no time. Choose any colors you wish, or make a scrap quilt. Two contrasting squares, each 8 1/2 x 8 1/2 inches. It's easy to align two slightly different sized squares prior to cutting – edges will be perfectly aligned afterward. Follow the instructions below, and take a peek at the photo. Place two fabrics together, the right sides of each facing up, and trim through both layers to create two 8 1/2 x 8 1/2-inch squares. Cut a gentle (freehand) curve through both fabrics, from one side to the other. Gather a contrasting curve of each fabric, shown here in blue and yellow. Slide the convex curve (shown in blue) into the opening of the concave curve (yellow). The fabrics should match since you cut the freehand curve through both layers. Use a non-permanent marker to mark the mid-point where curves come together (left photo). Find the spot by placing a ruler along the diagonal and making tic marks where fabrics meet. You could also fold and finger-press one of the curved pieces at its midpoint before matching it with its partner, and then mark both the fold and the adjacent curve. Place the smaller curved piece on top of the larger piece, right sides together and pin-matched at marked midpoints (right photo). Finish pinning the two pieces together along the curve, starting at each side of the center point and moving out toward the edges. The edges of patchwork probably won't match up. Sew a seam along the curve, making sure it is at least 1/4 inch wide. A slightly larger seam allowance is fine. Left photo. Check the seam allowance. If it is less than 1/4 inch, or uneven, add stitches that flow with the original seam line (stitch and backspace at the beginning of the correction seam). Right photo. Flip the block over and check the seam. If tucks exist, you will need to remove the seam and sew again (illustration). Don't worry if this occurs, the process becomes trouble-free as you sew more blocks. Make a second Wonky Drunkard's Path quilt block from the two remaining curved pieces. Colors will be in reverse positions in the second block. Cut and sew another pair of fabrics to make two more quilt blocks. Use a rotary ruler (or clear template) to trim each block to measure 6 1/2 inch square. Make sure to leave at least 1/2 inch of background fabric on each side of the inset curved piece. ​Left Illustration - incorrect placement, with no excess blue background fabric beyond the yellow curve. Right Illustration - correct placement, with plenty of yellow background fabric beyond the curve. Remember that blocks are freehand, and will not look exactly like the two blocks shown in the photo. Your own blocks will vary, too. Continue creating more quilt blocks until you've accumulated enough for the size quilt you wish to make. When calculating yardage, remember that, although you're beginning with 8 1/2 inch squares, blocks actually finish at 6 inches. Drunkard's Path quilt blocks can be arranged in numerous ways. Use any search engine to search for the quilt name, and view the images that pop up, or simply place your blocks on a design wall and play with layouts until you're happy with the quilt's appearance.